(5) What norms should guide responsible scientific skepticism about climate change. Why Exxon’s and Other Fossil Fuel Companies’ Funding of the Climate Change Disinformation Campaign Cannot be Excused As an Exercise in Free Speech but Must be Understood as Morally Reprehensible Disinformation. This website has produced many articles and several videos describing and analyzing the climate change disinformation campaign that has been funded by fossil fuel companies, other corporations whose economic interests are threatened by placing restrictions on fossil fuel use, industry associations, and free-market fundamentalist foundations. These analyses have concluded that these entities have engaged in morally reprehensible disinformation that should be distinguished from responsible scientific skepticism (See site index above under “disinformation campaign and climate ethics”). A recent study published in the Proceedings of the National Academies of Science (PNAS) in October shows that the climate denial echo chamber organizations were funded by ExxonMobil and Koch family foundations and produced misinformation that effectively polluted mainstream media coverage of climate science and polarized the climate policy debate. The Study is: Corporate funding and ideological polarization about climate change, October 12, 2015. This study’s analysis of 20 years’ worth of communication data between participants in the climate change countermovement by Yale University researcher Dr. Justin Farrell shows beyond a doubt that ExxonMobil and the Kochs have been key actors who funded the creation of climate disinformation think tanks and ensured the prolific spread of their doubt products throughout our mainstream media and public discourse about climate change. “The contrarian efforts have been so effective for the fact that they have made it difficult for ordinary Americans to even know who to trust,” Dr. Farrell told the Washington Post. “This countermovement produced messages aimed, at the very least, at creating ideological polarization through politicized tactics, and at the very most, at overtly refuting current scientific consensus with scientific findings of their own,” Dr. Farrell, the author of the study said. Corporate funding likely influences the nature and content of polarizing texts pertaining to climate change, according to a study. Political polarization has become a hallmark of climate change policy discussion, with multiple groups in various sectors contributing to public discourse regarding climate and energy. 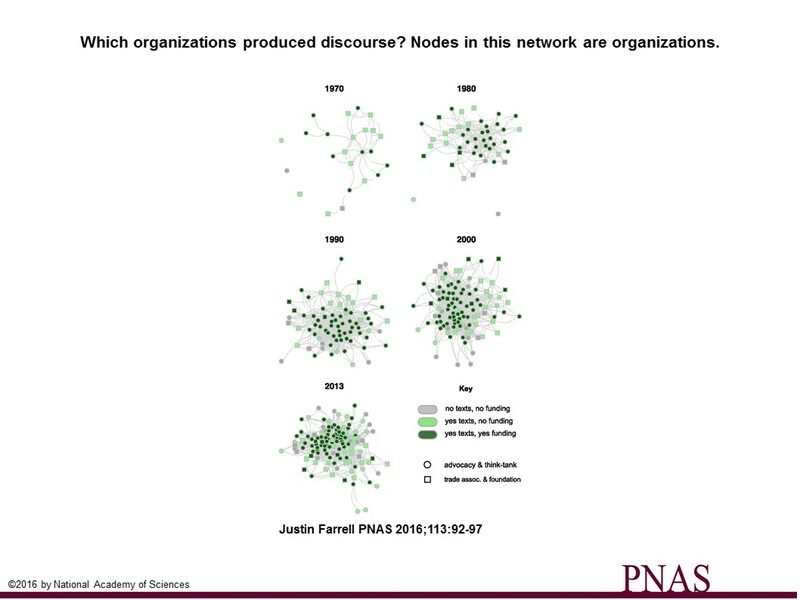 To quantify the influence of corporate funding in climate change discourse, Justin Farrell analyzed more than 39 million words of text produced by 164 organizations active in the climate change counter-movement between 1993 and 2013. The author examined the ideological content of the produced texts, as well as the funding behind the organizations that produced the texts. Organizations with corporate funding were more likely to have produced polarizing texts, the author found, with ExxonMobil and the Koch family foundation acting as influential funders (emphasis added). Further, according to the author, corporate funding may have influenced the ideological content of produced texts. The results suggest quantitative evidence of the influence of funding in the climate change debate that had previously been hypothesized, and suggests an analytical model for integrating texts with the social networks that created them, according to the author. First, that organizations with corporate funding were more likely to have written and disseminated texts meant to polarize the climate change issue. Second, and more importantly, that corporate funding influences the actual thematic content of these polarization efforts, and the discursive prevalence of that thematic content over time (Study abstract). Thus this study, which was published by the very prestigious US Academy of Sciences, provides further evidence that the public deception orchestrated by the fossil fuel industry actually influenced the cultural understanding of climate change in the United States, and therefore should prove valuable to investigators examining ExxonMobil and other fossil fuel companies as well as other current and future efforts to hold these corporations accountable for their disinformation. The following chart from the Natural Academy study depicts how the entities comprising the denial campaign communicated with each other. Recently, the Attorneys General from Massachusetts and New York initiated legal proceedings to hold Exxon and other fossil fuel companies liable for fraud. The fossil fuel industry has responded to these suits by fiercely waging a campaign that claims that any legal action against the fossil fuel companies for funding organizations engaged in climate change denial activities is tantamount to a legally inappropriate suppression of free speech (See: Climate change vs. free speech: Punishing fossil fuel companies for expressing doubt). 1. 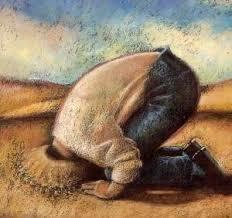 Lying or reckless disregard for the truth about mainstream climate change science. 2. Cherry-picking mainstream climate science by focusing on an issue about which there may be some scientific uncertainty while ignoring a vast body of climate science which is well-settled. 3. Manufacturing non peer-reviewed climate change science claims. 4. The creating think tanks, front groups, and Astroturf groups which widely have disseminated untruthful claims about mainstream climate science and which were created to hide the real parties in interest, members of the fossil fuel industry. 5. Publishing and widely disseminating dubious manufactured climate change scientific claims that have not been subjected to peer-review. 6. Widely attacking mainstream climate scientist and journalists who have called for action on climate change. 7 Cyber-bullying mainstream climate scientists and journalists. A few of these tactics are always ethically troublesome including creating conservative think tanks, front groups, Astroturf groups, and PR campaigns whose very creation was motivated to fool people about who the real parties in interest are behind claims that attack mainstream climate science. These organizations have also manufactured bogus climate science claims, cyber-bullied climate scientists and journalists, and widely published claims about climate change science that have not been subject to peer-review. Corporations who fund these ethically troubling tactics are particularly ethically loathsome because they are using their economic power to deceive the public and intimidate mainstream scientists and journalists in the pursuit of economic self-interest. Certain facts about climate change make these ethically obnoxious tactics even more reprehensible. They include the fact that climate change is a problem that the longer governments wait to take action to prevent damage, the worse the problem becomes and the more difficult and more expensive it becomes to solve it. The climate change disinformation campaign has been responsible for at least 30 years of inaction and, as a result, enormous and expensive greenhouse gas reductions are now required of the entire world to prevent potentially devastating and catastrophic climate change impacts. These impacts will likely be most harshly experienced by poor countries around the world which have done very little to cause theca climate problem. In addition, those most vulnerable to the harshest climate impacts have never consented to nor been consulted about waiting until all climate science uncertainties are resolved before action is taken. For these reasons, just as screaming fire in a crowded theater when no fire exists is not construed to be a justifiable exercise of free speech, climate change science disinformation cannot be justified on free speech grounds and must be understood as the morally indefensible behavior of many fossil fuel companies, some corporations and industry organizations, and free market fundamentalist foundations that have funded the climate change disinformation campaign. Just as It is morally reprehensible to call fire in a crowed theater when there is no evidence of a fire because such reckless behavior will likely cause harm to people panicking to run to safety, telling those responsible for GHG emissions that there is no evidence that human activities are causing and threatening climate induced harms will likely cause great damage because inaction guarantees that atmospheric concentrations of GHG will continue to rise and remain in the atmosphere for thousands of years and likely cause great harm and perhaps make it impossible to prevent catastrophic damages to human health and ecological systems on which life depends. In fact not only is the the deceit propagated by the fossil fuel companies and others funding the disinformation campaign unjustifiable on free speech grounds it is so harmful that it may create legal liability for those entities who have funded the disinformation campaign. Climate change disinformation is responsible for almost a 40 year delay in reducing GHG emissions to safe levels and harsh climate change impacts are already visible in many parts of the world caused by rising seas, much more intense storms, droughts, and floods. And so some of the great harm caused by the climate change denial countermovement is already being experienced even though the most catastrophic climate change harms will be experienced in future decades. This is the 3rd entry in a series that has been examining the practical significance for climate change policy formation of insights of sociologists about the failure of governments to respond to the enormous threat of climate change. This series is reviewing a new book about the social causes of climate change. The book is Climate Change and Society, Sociological Perspectives by Riley Dunlap and Robert Brulle, eds., Oxford University Press, 2015, New York. In the first entry in the series, we described why sociological explanations for the success of the opponents of climate change policies and identification of deep ethical and moral problems with arguments made by climate change policy opponents largely have been missing from mainstream climate change literature and the media coverage of human-induced warming issues. In the second entry in this series, we looked at the insights from sociology about the morally reprehensible climate change disinformation countermovement. 1. Pay attention to and educate others on how civil society’s understanding of climate change issues has been manipulated by powerful forces, that is, help citizens see the wizard behind the curtain who has been projecting a false understanding of climate change matters. In the first entry in this series, we reviewed the conclusions of sociologists summarized in the Dunlap/Brulle book about why most of the climate change literature relevant to relevant to changing the dangerous path the world was on assumed that the primary challenge was to motivate individuals to respond to the danger of climate change described by scientists. Therefore, many of not most climate policy advocates focused on how to improve messaging about climate change policies or how to we incentivize individual behavioral change through the use of economic incentives. We also explained that for over 30 years, proponents of action on climate change mostly focused on responding to the arguments made by opponents of climate change that government action on climate change was unjustifiable due to scientific uncertainty and high costs of proposed climate policies. Because motivating individual behavior to engage in activities that don’t produce GHGs was assumed to be the major challenge to improve government responses to climate change, proponents of climate change policies have largely relied on the disciplines of economics and psychology, two disciplines which claim expertise on how to motivate individual behavior, to make policy recommendations on how to change individual responses to climate change. Yet sociologists warn that individuals almost always make decisions in response to the cultural understanding of the problem of concern. Therefore, large scale individual behavioral change on climate change is not likely as long as many people are influenced by the cultural narrative pushed by the opponents of climate change that climate change science is uncertain and that proposed responses to climate change will create great unacceptable damage to a nation’s economy. Therefore, those working to improve government and individual responses to climate change should adjust their tactics to respond to the insights of sociologists that have concluded that citizens need to understand how the cultural understanding of climate change has been shaped by powerful actors who have used sophisticated tactics to achieve support for their position that climate change policies should be opposed on the basis of scientific uncertainty and unacceptable costs to the economy. It is not enough for proponents of climate change policies to simply make counter scientific and economic “factual” arguments to the scientific and economic claims of the climate change policy opponents, advocates for climate policies need to help citizens understand what interests are responsible for the disinformation that is the basis for the false arguments made by opponents of climate change policies, why the tactics used the opponents of climate change policies are morally reprehensible, and why the arguments of those opposing climate change policies will continue to create huge injustices and immense suffering in the world. (g) cyber-bullying scientists and journalists who get national attention for claiming that climate change is creating a great threat to people and ecological systems on which life depends. The notion of autonomous individuals responsible for their personal choices is widely held among US policymakers, the media and the general public and is of course quite compatible with the assumptions of economics and psychology. But simply pursuing strategies to motivate individual behavioral change without helping citizens understand how the cultural understanding of climate change was manufactured by morally indefensible strategies, does little to change the cultural understanding of the problem held by many. Proponents of climate change policies need to help citizens see who is the wizard behind the screen which has over and over again been making false claims about the lack of scientific grounding for the conclusions that humans are responsible for creating huge climate change threats. Proponents of climate change policies need to achieve greater understanding of and focus on who is funding the false claims of the opponents of climate change policies, and how they are organized and communicate, what tactics they have and continue to use to propagate a false narrative, and how the actions of politicians who resist action on climate change are linked to the the climate change denial countermovement. In the last month,19 US Senators led by Senator Sheldon Whitehorse have begun to publicize the role of fossil fuel coal companies in misleading citizens on climate change (See Web of Denial). This political effort has been made possible by the sociological work of Dunlap, Brulle, and McCritte, among others. And so there is a growing body of sociological work that is now available to help citizens understand how the cultural understanding of climate change has been manipulated at the federal level in the United States and in several other countries. However, additional sociological analysis is needed to better understand how opponents of climate change policies have successfully manipulated the government response to climate change at the State and local level in the United States and other countries, matters which the Dunlap/Brulle book acknowledges. Simply improving messaging in accordance with recommendations of psychologists or following the recommendations of economists to create economic incentives to engage in less GHG producing behavior will not likely create strong citizen support for climate change policies unless citizens better understand that the narrative created by opponents of climate change policies about high levels of scientific uncertainty and unacceptable harm to the economy from the adoption of climate policies is not only false but has been manufactured by fossil fuel companies and other entities which have economic interests in continuing high levels of fossil fuel consumption. 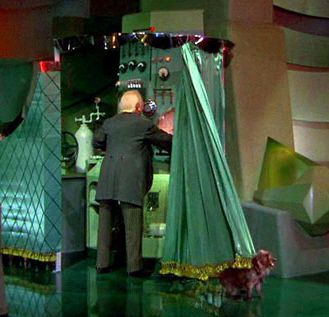 Advocates of climate policies need to help citizens understand that the wizard behind the curtain has been the fossil fuel industry, their industry organizations, free-market fundamentalists foundations, and the politicians who represent the interests of and are often funded by these groups. As we have seen, in the first two entries in this series, the new book edited by sociologists Dunlap and Brulle includes information on how participants in the denial countermovement have prevented governments from responding to climate change by undermining the scientific basis on which claims about the urgent need to take action. The participants in the countermovement have attacked climate models, paleoclimatic data on which warming trends are based, modern temperature records, mainstream scientists who have claimed there is an urgent need to act, and manufactured bogus non-peer-reviewed climate science claims which they have then widely publicized in books and pamphlets, and then widely circulated the publications to journalists and politicians, tactics which have succeeded in getting the disinformation propaganda widely distributed by friendly media. (Dunlap, R., and McCright, 2015, p. 306–307). 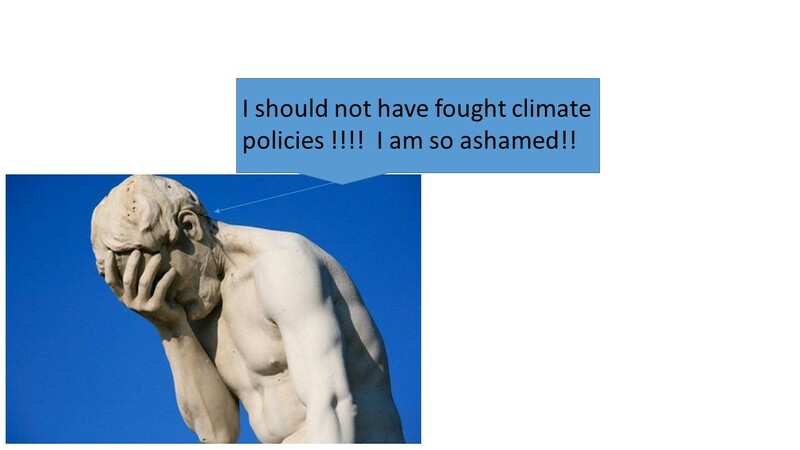 The climate denial countermovement has also blocked critical reflection on and serious debate about climate change through other strategies which seek to promote the idea that civil society will be better off if climate change policies are not adopted. These strategies have included funding politicians that will promote the interests of participants in the climate change denial countermovement, placing people sympathetic to the interests of the fossil fuel industry in positions of authority in government institutions with regulatory authority, limiting the budgets of government environmental agencies in ways that prevent government action on climate change, orchestrating political opposition to climate change legislation through funding campaigns and lobbying efforts, and stroking the fear of individuals about adverse economic effects of climate change legislation (Dunlap, R., and McCright, A., 2015, p. 306–307). As we have seen in the first entry in this series, opponents of climate change policies have also successively tricked proponents of climate change policies and the media covering climate change issues to focus on “factual” scientific and economic arguments while ignoring the deep moral and ethical problems with these arguments. Advocates of climate change policies need to better educate civil society about how opponents of climate change policies are actually preventing government action on climate change. On these issues. sociological research can be helpful in explaining what has happened to prevent government action on climate change..
Sociologists can help citizens understand how the concentrated wealth of the opponents of climate change policies have created an enormous inequality in the ability of different groups to participate in public decisions about climate change. For this reason, advocates of climate change policies need to publicize the details of how the opponents of climate change use the political processes open them to achieve their goals and why the opportunity for citizen involvement in climate change policy formation is often hindered by institutional structure and processes. 2. Help civil society better understand the ethical and moral limits of the economic narrative discourses which are dominating civil society’s understanding of the acceptability of climate change policies. The Dunlap/Brulle book explains how the discourse of neoliberal economic ideology has dominated political approaches to society’s problems. (Dunlap, R. and McCright, A. 2015, p. 304) This ideology holds that civil society is better off if market capitalism is left alone and unimpeded by regulations that interfere with the generate of wealth. Advocates of neoliberal ideology value individual rights. private property, laissez-faire capitalism, and free enterprise (Dunlap, R. and McCright, A. 2015, p. 302). Because neoliberal ideology has dominated political life in many countries including the United States, many if not most proponents of climate change policies have advocated for “market” based solutions to climate change such as carbon taxes or cap and trade programs. Yet market ideology often ignores moral and ethical questions such as on what justice and fairness considerations should the burdens of reducing GHG emission be allocated. Yet questions of distributive justice about which nations should bear the major responsibility for most GHG reductions at the international level have and continue to block agreement in international climate negotiations, as well as questions about which countries should be financially responsible for adaptation costs and damages in poor countries that are most vulnerable to climate change’s harshest climate impacts and who have done little to cause the problem. The failure of nations to consider act on what equity and justice requires of them to reduce the threat of climate change has been at the very center of the most contentious disputes in international climate negotiations (See, Brown, 2013, On the Extraordinary Urgency of Nations Responding To Climate Change on the Basis of Equity). For these reasons, proponents of strong climate change policies should expressly integrate ethical and moral considerations into their analyses of climate change policies. Ignoring these issues will likely continue to be responsible for the lack of media coverage of these issues, despite the fact that there is an enormous need at the international level for nations to respond to climate change at levels consistent with what justice requires of them if a global solution to climate is become viable. In addition, every national GHG emissions reduction target is implicitly a position on the nation’s fair share of safe global emissions. Therefore, nations must face the question of what does fairness and justice require of it when formulating national climate policy, yet issues of justice and fairness are virtually absent from US media coverage of US climate policy. Also, the magnitude of GHG emissions reductions committed to by a nation is implicitly a position on how much warming damage a nation is willing to inflict on others around the world, a matter which is a moral issue at its core. The failure to identify the ethical and moral dimensions of a nation, state, or regional governments GHG reduction target an invitation to hide profound moral and ethical issues behind scientific “factual” matters thus preventing public debate about what justice and morality require of governments. 3. Educate civil society about climate change issues in ways that will promote and sustain a social movement about climate change. Sociology studies how large scale social change is produced by social movements (Caniglia, B.,S., Brulle, R. and Szasz, 2015, p. 235). Given the civilization challenging nature of climate change, many observers of the failure of governments to respond to the threat of climate change have concluded that creating a strong social movement on climate change is the best hope of preventing catastrophic harm from human-induced warming given the enormity of the challenge facing the world. For this reason, proponents of strong climate change policies should work consciously to build and sustain a social movement to aggressively reduce GHG emissions mindful of what works to make social movements arise, become effective, and be sustained..
Sociology has developed an extensive and robust literature on the process of social change driven by citizen mobilization, including the development and advocacy of alternative policy perspectives, the creation of new organizations, how these organizations can affect both corporate actions and public policy (Caniglia, B.,S., Brulle, R. and Szasz, S.. 2015, p. 235). (e) and that every day that action is not taken to reduce greenhouse gas emissions, it makes the problem more difficult to solve. Social movements focus members of civil society on particular dimensions of social problems of concern and provide their publics with clear definitions of those problems, along with arguments regarding who is at fault and what options exist for solving their social grievances. (Caniglia, B.,S., Brulle, R. and Szasz, S., 2015, p.237) For this reason, proponents of climate change policies should seek to widely educate civil society about who has funded the numerous participants in the climate change countermovement and the morally reprehensible tactics that they have used. Although sociologists have now documented which corporations, corporate industry groups, and free-market fundamentalists foundations and institutions have been most responsible for the spread of climate change disinformation at the national level in the United States and a few other countries, knowledge about who is blocking climate change action at the state and local level has not yet widely been developed. Proponents of climate change policies should seek to assure that civil society understands what corporations, institutions, and foundations have been responsible for climate change disinformation and which politicians have advanced the interests of these groups at the national level and seek to better understand, perhaps working with sociologists, entities and politicians most responsible for resistance to climate change policies at the state and regional level. To create and sustain a social movement on climate change, it is not enough for advocates of climate change policies to counter the false scientific and economic claims of climate change policy opponents, they must constantly seek to educate civil society about the causes of the grave injustices that climate change is causing if they seek to build and sustain a social movement on climate change. This is the second entry in a three part series on sociological insights about the social causes of climate change in a new book on sociology and climate change. The book is Climate Change and Society, Sociological Perspectives by Riley Dunlap and Robert Brulle, eds., Oxford University Press, 2015, New York. In the first entry in this series, we described the new book’s contributions to understanding why a sociological understanding of the cause of climate change and reflection on the deep ethical and moral problems with the arguments of the opponents of climate change policies are mostly missing from the dominant climate change literature and the media coverage of global warming. This entry looks at the books conclusions of how mainstream climate change science has been undermined by opponents of climate change policies and thereby changed the cultural understanding of climate change, initially in the United States, and later, in other countries. Before reviewing the contributions of the new book to understanding how powerful interests undermined proposed national responses to climate change through the creation of a countermovement, we note the enormity of the damage that has been caused by the over three decade delay in responding to climate change which is attributable to the success of this climate denial countermovement. Now that: (a) atmospheric concentrations of CO2 are in excess of 403 ppm, (b) the world agreed to try and limit warming to 1.5 degrees C in Paris at COP21 under the UNFCCC to prevent potentially catastrophic harm to hundreds of millions of poor, vulnerable people around the world and the ecosystems on which they depend, (c) to stay within the 1.5 degrees C warming limit will require rapid civilization challenging GHG emissions reductions in most countries, and (d) these needed reductions are so steep that it may be impossible to stay within a carbon budget that must constrain global GHG emissions to prevent warming from exceeding the limit, the denial countermovement discussed in this the book is likely responsible for enormous amount of harm around the world particularly to those poor people who are most vulnerable to rising seas, storm damage, drought, floods, vector borne disease, killer heat waves and,acidifying oceans. For this reason, the denier countermovement is not just a morally and ethically reprehensible phenomenon, but a heinous global tragedy. Although the new book on sociology and climate change contains many insights about how economically powerful entities have changed the cultural understanding of climate change and thereby prevented the United States and some other countries from responding to the growing threat of climate change, one chapter, in particular, titled Challenging Climate Change, The Denial Countermovement describes how some fossil fuel companies, corporations that depended on fossil fuel, business organizations, and free-market fundamentalist foundations successfully prevented government action on climate change (Dunlap, R., & McCright, A., 2015. p. 300). Before describing this chapter’s contribution to understanding how the climate disinformation campaign accomplished its goals of preventing the regulation of fossil fuel, we note that this website includes 17 entries on the climate change disinformation campaign which both explain many aspects of this campaign and importantly distinguish the tactics of this campaign from legitimate climate skepticism (See, Start Here and Index Tab above under Disinformation Campaign and Climate Ethics). The Dunlap/Bruelle book refers to the climate change disinformation campaign as a countermovement. A countermovement is a sociological term for a social movement that arises in response to another social movement that threatens the interests of those who form the countermovement. The climate change countermovement arose when those corporations and organizations who were threatened by calls for governments to take action to reduce the threat of climate change organized themselves to protect their economic interests that would be threatened by regulation of fossil fuels. The climate denial countermovement is often identified as an extention of an anti-environmental countermovement that began to form after Earth Day in 1970 when some corporations and free-market fundamentalists foundations reacted to the large number of environmental laws that were passed in the early 1970s at the beginning of the modern environmental movement. The chapter in the new Dunlap/Brulle book on the climate denial countermovement both reviews some previously published sociological analyses of this countermovement and contains new information on how powerful economic interests have undermined government policy-making on climate change. The Dunlap/Brulle book asserts that efforts to deny climate change began to get organized in the United States shortly after James Hansen testified in the US Senate in 1988 that climate change was already visible, testimony which put climate change squarely on the US public agenda (Dunlap, R. and McCright, A., 2015, p. 300). The book further claims that organized denial continued to grow and reached an unprecedented level in 2009 when the newly elected Obama administration and the Democratically controlled Congress increased the likelihood of US action to reduce greenhouse gas emissions with the result that no climate change legislation was enacted. The book claims that these efforts have continued relatively unabated since then (Dunlap, R. and McCriight, A., 2015, p.300). Further, climate change denial has become a virtual “litmus test“ for Republican politicians, strongly enforced by elements of the conservative movement (Dunlap, R. and McCriight, A., 2015, p. 300). The book outlines the historical and cultural conditions that have provided fertile soil for the climate denial countermovement including the rise of the anti-government sentiment in the United States that grew with the Presidency of Ronald Reagan. This analysis attributes the displacement of Keynesian economics from the late 1940s until the 1970s by the anti-regulatory economics of neoliberalism as responsible for a fundamental shift in governing philosophy that significantly reduced constraints on capital accumulation and growth. This created a “global growth imperative” that was hostile to the kind of government regulation required to reduce the threat of climate change (Dunlap R., and McCright, A., 2015, p 303).The authors stress that an understanding of the success of the denial countermovement requires some understanding of the growth of the global economic system and its ideological grounding by conservative politicians (Dunlap, R. and McCright, A., 2015, p. 303). The chapter asserts that leading fossil fuel corporations (most notably ExxonMobil and Peabody Coal, industry associations (e.g. for example American Petroleum Institute and Western Fuels) initially led efforts to deny climate change. (Dunlap R. and McCright, A., 2015, p 310). These fossil fuel actors were joined by a wide range of other corporations and business associations to fund climate science deniers and Conservative Think Tanks and various groups promoting climate change science denial (Dunlap R. and McCright, A., 2015, p. 310). The book explains some corporations and their allies viewed the rise of the environmental movement in the1970s with alarm and as a result opposition to environmental programs developed particularly in the American West where battles over access to natural resources raged and became a component of a wider conservative countermovement that was born in the 1970s in reaction to the progressivism of the 1960 (Dunlap, R. and McCright, A., 2015, p 304). The chapter also notes that the international environmental policy agenda in the early 1990s, symbolized by the 1992 Rio “Earth Summit,” greatly threatened conservatives’ and industries’ neoliberal agenda and unfettered global markets (Dunlap. R. and McCright, A., 2015, p. 305). The book claims that conservatives in the United States learned from the Reagan administration’s experience that it was unwise to attack environmental protection directly, given that Americans were generally supportive environment protection (Dunlap, R. and McCright, A., 2015, p.306). As a result, the book claims the conservatives and their industry allies learned to prevent the implementation of government policies that might threaten their political and economic interests by undermining the scientific foundations of environmental policy proposals (Dunlap R.and McCriight, A., 2015, p.306). As result conservatives seized upon the strategy of “manufacturing uncertainty” that had been previously effectively employed for several decades by corporations and entire industries, most notably the tobacco industry in efforts to protect their products from regulations and lawsuits by questioning the scientific adequacy of claims that their products were hazardous (Dunlap, R. and McCright, A., 2015, p.306). As a result, conservatives began labeling science supporting the need to regulate industry to protect the environment as “junk science.” This strategy became the favored tactic employed by conservatives and their industry allies when government showed interest in expanding environmental regulation and the major focus of attempts to prevent the adoption of climate change policies in the early 1990s (Dunlap, R. and McCright, A., 2015, p.306). 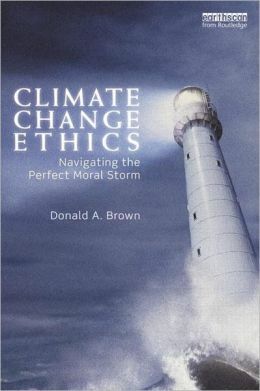 The book explains that participants in the denial movement undermined the public’s confidence in climate change science by attacking the validity of climate models, the use of paleoclimate data to establish climate trends, attacked individual climate scientists and scientific institutions, published dubious non-peer reviewed climate science reports, funded self-proclaimed climate scientists exporters, and many other tactics that manufactured scientific uncertainty. The book explains why the complexity of climate change science made it particularly vulnerable to a strategy of manufacturing uncertainty designed to defeat proposed government regulation of industry and to create public controversies about the science (Dunlap, R. and McCriight, A., 2015, p.309). The book also explains how the denial countermovement has evolved, changed, and expanded over the past quarter-century, changes that included new key actors, supporters, and tactics while the basic strategy of manufacturing uncertainty has expanded into manufacturing public controversy about climate science up until the present (Dunlap, R. and McCright, A., 2015, p.309). The book also identifies the major participants in the denial countermovement which include portions of the fossil fuel industry and corporate America, conservative think tanks, a relatively small number of contrarian scientists, front groups and Astroturf organizations, conservative politicians and media, and the denial blogosphere (Dunlap, R. and McCriight, A., 2015, p.309). The chapter on the denial countermovement ends with an acknowledgment that further sociological research is necessary to better study the evolving countermovement’s components, strategies, and tactics not only within individual nations but also across nations to better understand how this phenomenon has become a full-fledged global advocacy network. The last post in this series will identify the importance of sociological insights about government responses to climate change for advocates of climate change policies. Insights from New Book on Sociology and Climate Change: Why Has an Understanding of the Sociological Causes of the Failure of Government to Respond to Climate Change and Identification of the Deep Ethical Problems with Most Arguments Against Climate Policies Been Missing from Most Climate Change Literature? This is the first in a series of three posts that will identify important insights about the social causes of climate change in a new book that examines climate change through the lens of sociology. 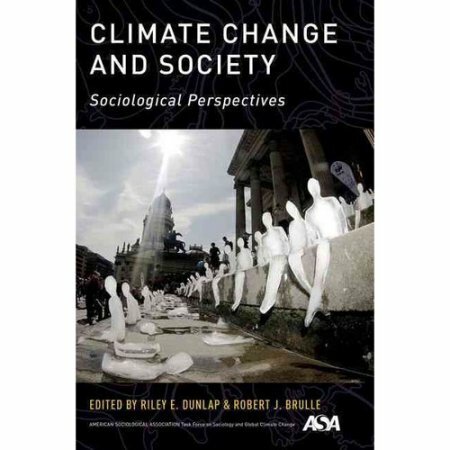 This new book is Climate Change and Society, Sociological Perspectives by Riley Dunlap and Robert Bruelle, Oxford University Press, 2015, New York. Before discussing the insights of this new important book, we note that many entries on this blog site have explained that for over 30 years opponents of climate change policies have mostly made two kinds of arguments in opposition to climate change policies. First, they have argued that proposed policies designed to lessen the threat of human-induced climate change should be opposed because there has been inadequate scientific support for the conclusion that human activities are causing climate change harms which are threatening humans and ecological systems on which life depends. Second, opponents of climate change policies have made a variety of economic arguments that proposed climate change policies were too expensive, would destroy jobs, decrease national GDP, or otherwise would impose unacceptable costs on the nation’s economy. In the United States and in a growing number of countries around the world these scientific uncertainty and unacceptable economic impact arguments have dominated disputes about proposed climate change policies since the mid-1980s. Proponents of climate change policies have almost always responded to these claims by disputing the factual claims about scientific uncertainty or unacceptable cost made by climate change policy opponents. And so, proponents of climate change policies have inadvertently allowed opponents of climate change policies to frame the public policy debate so as to limit the public controversy about climate change to disputes about scientific and economic “facts.” Largely missing from this three decade debate have been analyses of why the arguments of climate change policy opponents are not only factually flawed but ethically and morally bankrupt. Although a climate change ethics and justice literature has been growing for over a decade, the public debate about climate change has largely ignored strong ethical and moral problems with the scientific and economic arguments that have been the consistent focus of the opponents of climate change policies. Until the last few years, also largely missing from the public debate about climate change has been serious analyses of which organizations and interests have been most responsible for the arguments made by the opponents of climate change, who funded these organizations, what tactics have they used, and how can we understand that success of the climate change policy opposition in undermining serious responses to the growing threat of climate change. In other words, missing from the public discussion about climate change has been serious analyses of how the opponents of climate change policies have successfully blocked government responses to climate change despite increasingly louder and more intense calls from the mainstream scientific community that government urgently must act to prevent catastrophic harms from climate change. That is, largely missing from the climate change debate has been any sophisticated analyses of how self-interested corporations. organizations, and ideological foundations have been able to manipulate a democracy to prevent the government from responding to a huge potential threat, matters which are the domain of the discipline of sociology. Sociologists often seek to understand how self-interested minority groups within society can frequently hide the ethical and moral problems with their arguments by framing important public controversies in such a way that the ethical and moral problems raised by their arguments are hidden from public scrutiny. This framing works to hide the ethical and moral problems with arguments made by the opponents of government action to solve social and environmental problems by tricking the public to debate “factual” claims, such as those made by scientists or economists, as if there were no moral or ethical problems with these claims. As a result, in the case of climate change, rather than debating whether it is morally acceptable for some people to put large numbers of other people at great risk from catastrophic harm on the basis that there’s some scientific uncertainty that the catastrophe will happen, the public is tricked into narrowly debating whether the catastrophe will happen with high levels of scientific certainty even in cases where waiting until all the uncertainties are resolved with high levels of confidence will likely make it too late to prevent the catastrophic harm. Rather than examining wether it is morally acceptable to delay action on climate change when delay will make the problem worse and the people most at risk have no say on whether to delay response action until scientific uncertainties are resolved, the public is tricked into debating the uncertainty. Rather than debating whether it is morally acceptable for one government to impose catastrophic harm on hundreds of millions of other people, citizens are tricked into arguing about the magnitude of the economic costs that will be experienced by the country causing the harm if response action is taken. As a result, in the United States, ethical and moral problems with the scientific uncertainty and unacceptable cost arguments made for over three decades by opponents of climate change policies have very rarely appeared in the US public debate about climate change that has been followed by the media. Although there has been a growing literature on the ethical and moral problems with arguments made by opponents of climate change policies and agreement among most ethicists that the arguments of most opponents of climate change are morally bankrupt, the mainstream climate change literature has rarely looked at the arguments of opponents of climate change policies through a moral lens. And so, one of the reasons why ethical problems with the arguments most frequently made by opponents of climate change policies have neither rarely appeared in the dominant climate change literature nor become part of the public debate about what a country like United States should do in response to the threat of climate change is because economically powerful opponents of climate change policies have successfully narrowly framed the issues that have been discussed in the public debate, a common problem in democracies recognized by sociologists. Also, largely missing in the public debate about climate change until very recently, has been sociological analyses of how those opposed to climate change have successfully created a social context about climate change, that is a cultural understanding of the problem in which individuals form opinions, Sociologists understand that culture is not fixed and and can change over time often in response to powerful forces that seek to affect widespread cultural understanding of a problem. Because individuals make decisions in light of the information about the problem provided by their culture, individual decisions about problems are often influenced by those who have sought to change the cultural understanding of the problem. Although sociologists have begun in the last decade to explain how a climate change countermovement, a sociological term which will be discussed in the next entry in this series, has successfully influenced the cultural understanding of climate change in the United States, very little of the sociological explanation of how this countermovement has succeeded in influencing the public’s understanding of climate change has appeared in the mainstream literature about climate change nor in media coverage of human-induced warming because the media also has largely reported on issues raised by opponents of climate change, namely, claims about scientific uncertainty and unacceptable costs of taking action. The absence of sociological insights on how economic power has distorted the public’s understanding of climate change is most striking in the work of organizations such as the Intergovernmental Panel on Climate Change (IPCC) that study climate change primarily through a scientific lens although they also have responsibility for making policy recommendations to decision-makers and in so doing have obligations to synthesize the relevant socioeconomic literature that should be considered by decision-makers. An analysis of the social science literature finds that economics is the most widely represented social science discipline in climate research. Fundamental to economic analysis of climate change is the “rational actor” model embedded in the discipline. The object of the analysis is the individual and the decisions and principles that each individual brings to the marketplace. Given the widespread societal influence of economics, it comes as no surprise that it has been highly influential in climate change research. For these reasons it is not surprising why IPCC has allowed economic considerations to dominate much of its analyses of to reduce climate change’s great threat in its first four assessments. IPCC’s work initially defines what needs to be done scientifically to prevent climate change’s jharm and it should be expected that it would turn to the two disciplines that claim they understand how to motivate individuals to do what needs to be done, namely economics and psychology. Yet these disciplines have little to offer about how the cultural understanding of climate change has been deeply influenced by those with strong economic interests in maintaining the status quo nor invite citizens around the world to examine responses to climate change from the lens of ethics and morality. Although, IPCC has made some improvement in covering ethics and justice in its 5th Assessment, much improvement is still needed (Brown, 2014). The next entry in this series will examine the insights from the Dunlap/ Brulle book about how the climate change denial countermovement influenced the cultural understanding of climate change initially in the United States and later in other parts of the world. As we have explained in several articles on this website, these tactics are not responsible skepticism but morally reprehensible disinformation. See for instance, An Ethical Analysis of the Climate Change Disinformation Campaign: Is This A New Kind of Assault on Humanity? 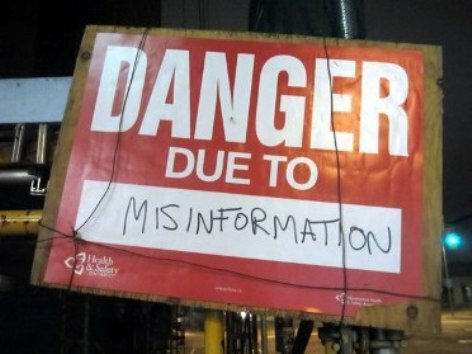 In writing about the disinformation campaign, this website has often relied upon the work of Dr. Robert Brulle, a sociologist from Drexel University, and Dr. Riley Dunlap, a sociologist from the University of Oklahoma, along with a few other sociologists who have been examining the climate change disinformation campaign through the lens of sociology for over a decade. Future generations will look back on our tepid response to global climate disruption and wonder why we did not act sooner and more aggressively. Climate change will adversely impact present and future generations, as well as all species on Earth. Our moral obligation to protect life requires us to act. Yet even after the recently completed United Nations climate conference, we are still on track for dangerous levels of climate change. Why haven’t we acted sooner or more aggressively? One answer can be found in the split over the veracity of climate science. Unfortunately, that path wasn’t taken. Instead, in 1989, a group of fossil fuel corporations, utilities and automobile manufacturers banded together to form the Global Climate Coalition. This group worked to ensure that the Kyoto Protocol, an international agreement to limit greenhouse gas emissions, was not adopted by the United States. In public statements, the Global Climate Coalition continued to deny that global warming was occurring and emphasized the uncertainty of climate science. While that coalition disbanded in 2001, ExxonMobil reportedly continued to quietly funnel climate misinformation through “skeptic” think tanks, such as the Heartland Institute, until 2006, when its funding was exposed. The company — the nation’s largest and wealthiest — continues to work with the American Legislative Exchange Council, a so-called public-private partnership of corporations and conservative legislators, to block climate change policies. 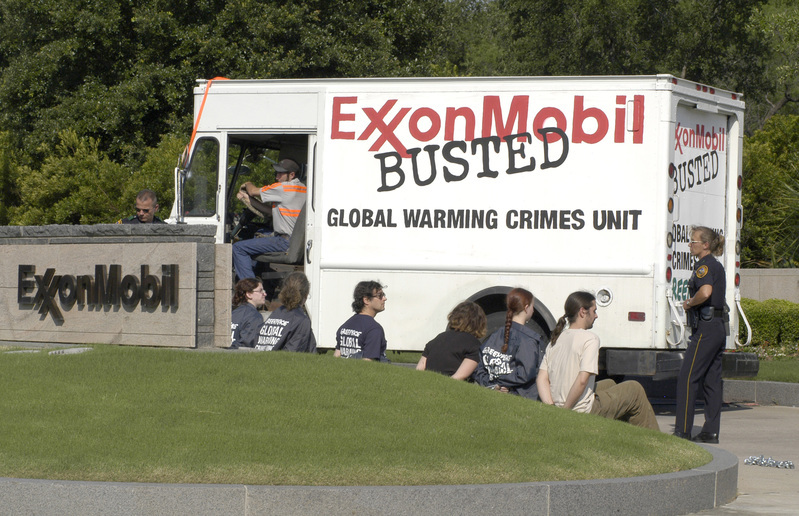 For years, ExxonMobil had been a participant in public efforts to sow doubt about climate change. Yet at at the same time, the corporation was at the leading edge of climate science and its executives were well informed regarding the scientific consensus on climate change. This allegedly deceitful conduct has generated public outrage and recently led New York’s attorney general to initiate an investigation into whether ExxonMobil has misled the public and investors about the risks of climate change. While important, these legal proceedings cannot fully address the larger moral issues of corporate social and political responsibility. Just as Congress investigated the efforts of the tobacco industry to dupe the public into believing its products were harmless, we need a full and open inquiry into the conduct of ExxonMobil and the other institutions whose misinformation campaigns about science have delayed our efforts to address climate change. The central concern here is the moral integrity of the public sphere. The Declaration of Independence says the legitimacy of government is based on the consent of the governed. But when vested interests with outsize economic and cultural power distort the public debate by introducing falsehoods, the integrity of our deliberations is compromised. Such seems the case today when we consider the fossil fuel industry’s role in distorting discourse on the urgent topic of climate change. If vested economic interests and public relations firms can systematically alter the national debate in favor of their own interests and against those of society as a whole, then the notion of democracy and civic morality is undermined. Congress can and should act to investigate this issue fully. Only then can we restore trust and legitimacy to American governance and fulfill our moral duty to aggressively address climate change. Dr. Brulle and Dr. Dunalp have just edited a new book, which synthesizes some of main sociological analysis on the climate change policy debate which is well worth reading by anyone interested in climate change. The book is Climate Change and Society, Oxford University Press. This website has been interested in working out the moral and ethical implications of the conclusions made by the sociologists working on climate change. This article explains the first two of several issues that citizens need to understand to evaluate appropriate national responses to climate change after the Paris Agreement. Although the mainstream media in the United States and other developed countries has widely reported on some aspects of the Paris Agreement, this series will describe important issues that are largely being ignored by press coverage of the Paris deal. The first issue is why a 25-year delay in responding to increasingly stronger scientific warnings of the danger of human-induced climate change has made the problem much more threatening. The second is the urgency of the need for hard-to-imagine action to dramatically reduce greenhouse gas (ghg) emissions at all scales, that is globally, nationally, and locally, but particularly in high-emitting nations such as the United States in light of the limited amount of ghgs that can be emitted by the entire world before raising atmospheric ghg concentrations to very dangerous levels and in light of the need to fairly allocate ghg emissions reductions obligations around the world. a. 186 nations have made commitments to reduce the threat of climate change although nations conceded in Paris that current commitments need to be upgraded to prevent dangerous climate change. b. All nations agreed to limit the increase in global average temperatures to “well below 2 °C above pre-industrial levels” – the level beyond which scientists believe the Earth will likely begin to experience rapid global warming and to “pursue efforts to limit the temperature increase to 1.5 °C above pre-industrial levels”, a warming amount which may also cause serious global harms particularly to many poor, vulnerable nations. Also the Paris Agreement says by the second half of this century, there must be a balance between the emissions from human activity such as energy production and farming, and the amount that can be captured by carbon-absorbing “sinks” such as forests or carbon storage technology. c. All countries agreed to submit updated plans that would ratchet up the stringency of emissions by 2020 and every five years thereafter. d. Nations agreed to report to each other and the public on how well they are doing to implement their targets and to track progress towards the long-term goal through a robust transparency and accountability system. e. Developed countries agreed to provide funding to help developing countries make the costly shift to green energy and shore up their defenses against climate change impacts like drought and storms and rich nations must report every two years on their finance levels — current and intended. The document refers $100 billion a year that rich countries had previously pledged to muster by 2020 as a “floor”. Under the new agreement the amount must be updated by 2025. The Paris Agreement has been widely and accurately portrayed in the mainstream media as creating a policy framework that has the potential to reduce the threat of climate change if nations greatly step up to what they have committed to do. (This framework could have been tightened by including more specific language on several issues proposed by some countries but rejected by others on such matters as human rights, losses and damages, legal effect of the agreement, and financing of adaptation among others, yet the framework includes provisions that these issues can be considered in the years ahead.) However, the enormity of the challenge facing humanity from climate change and the special responsibilities of high-emitting developed nations in particular has not been covered in the mainstream press at least in the United States. Although the mainstream media has widely reported on the fact that the national ghg emissions reductions that were made before the Paris COP are not sufficient to limit warming to 2 degrees C, the media, at least in the United States, has been largely failing to report on the urgency and enormity of the need to rapidly reduce ghg emission globally and how further delays in taking action will dramatically make the problem much more threatening. Looking at the delay caused by the climate change policy opposition in the United States is illustrative of the harm caused by political opposition to climate change policies worldwide. Furthermore, the Obama administration’s commitments still face strong opposition from the US climate change political opposition and are very likely to be rejected if a Republican becomes the next US President in 2016. Furthermore as long as US ghg emissions are exceeding the US fair share of safe global emissions, US ghg emissions are making the already very perilous climate change threat worse. 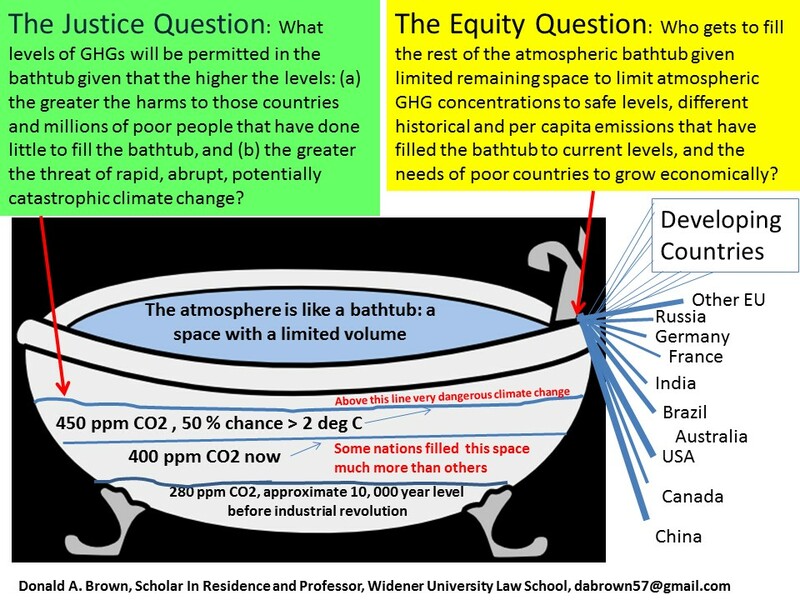 To fully understand the nature of the harm caused by this delay it is necessary to understand the policy implications of a “carbon budget” that must limit global emissions to avoid dangerous warming levels. .
To understand the policy implications of a carbon budget it is helpful to see the atmosphere as like a bathtub to the extent that it has limited volume and has been filling up with ghg so that atmospheric concentrations of CO2 have been rising in proportion to human activities which release ghgs. CO2 levels remained relatively stable for 10,000 years before the beginning of the industrial revolution at approximately 280 ppm (the lower line in the bathtub). 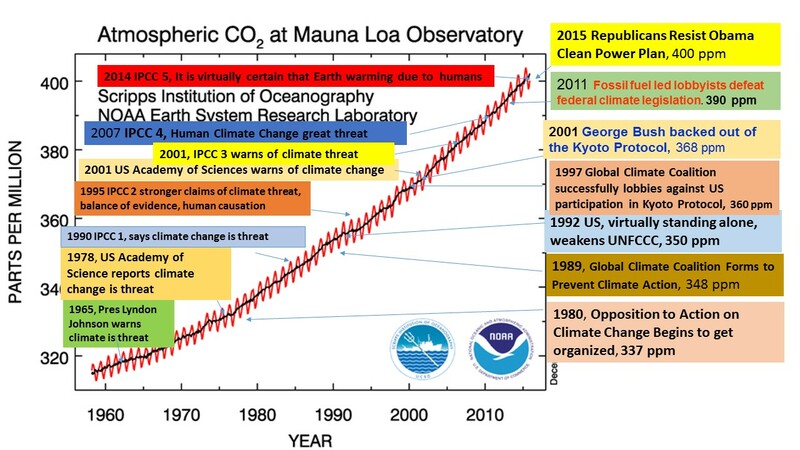 Human activities have been responsible from elevating CO2 atmospheric concentration levels to the current concentration of approximately 400 ppm (the second line from the bottom of the tub). Although there is considerable scientific evidence that limiting warming to 1.5 degrees C is necessary to prevent very dangerous warming, a fact implicit in the recent Paris Agreement in which nations agreed to work to keep warming as close as possible from exceeding 1.5 degrees C additional warming, if the international community seeks to limit warming to 2 degrees C it must assure that global emissions do not exceed the number of tons of CO2 emissions that will raise atmospheric concentrations to levels that will cause warming of 2 degrees C. This number, that is the number of tons of CO2 emissions that can be emitted before atmospheric concentrations exceed levels that will cause dangerous climate change, is what is meant by a carbon budget. The enormity of the challenge for the international community to keep warming from exceeding dangerous level can be understood by the fact that the remaining carbon budget is so small, that is approximately 270 gigatons of CO2, and current global ghg emissions are in excess of 10 gigatons per year and still rising, which means that even if the international community could stabilize global CO2 emissions levels there would be nothing left to allocate among all nations in 23 years. This grim fact is even bleaker if the international community concludes that it should limit warming to 1.5 degrees C, a conclusion that might become more obvious if current levels of warming start to make positive feedbacks visible in the next few years such as methane leakage from frozen tundra or more rapid loss of arctic ice. 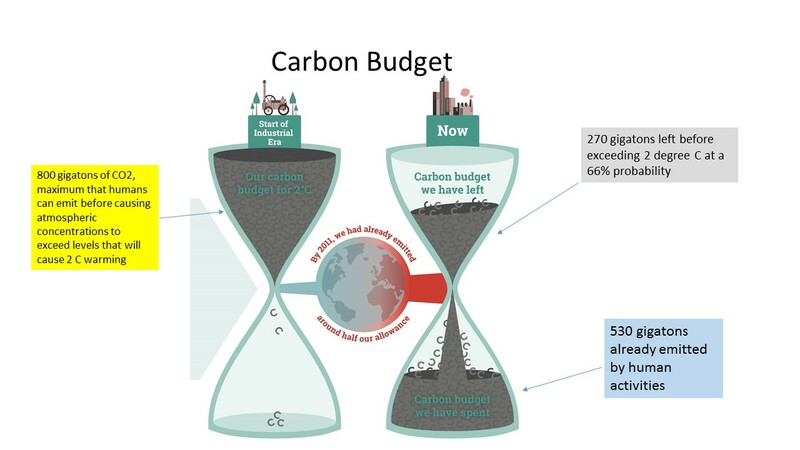 The concept of the carbon budget explains why waiting to reduce ghg emissions levels to a certain percentage in the future is more harmful than rapid reductions earlier because the longer it takes to reduce emissions the more the remaining budget is consumed. For this reason, a joint research project between Widener University Commonwealth Law School and the University of Auckland recommended in Paris that national climate commitments be stated in tons of emissions over a specific period rather than percent reductions by a given date because waiting to the end of specific period to achieve percent reductions will cause the total tons of ghg emitted to be higher than if reductions are made earlier. The enormous significance of the carbon budget can be seen from the following chart prepared by the Global Commons Institute. The illustration depicts the enormity and urgency of global emissions reductions that would be necessary to limit warming to 1.5 or 2.0 degrees C given the steepness of the reductions curves necessary to limit warming to 2.0 degrees C with a 50% probability (the red dotted line), 2.0 degrees C with a 66% probability (the blue dotted line), and 1.5 degrees C (the green dotted line). The steepness of these curves superimposed on actual national ghg emissions levels is an indication of the enormity of the challenge for the international community because the emissions reduction curves are much steeper than reductions that can be expected under projections of what current national commitments are likely to achieve if fully implemented. The steepness of these reductions curves is somewhat controversial because any calculation of a carbon budget which determines the steepness of the the needed reduction curve must make assumptions about when positive feedbacks in the climate system will be triggered by rising temperatures, yet these controversies are reflected in giving different probabilities about the likelihood of achieving a specific warming limit. Yet even carbon budgets which have been discussed in the carbon budget literature which have assumed lower amounts of positive feedback yield very. very steep reduction curves. The enormous increase in the magnitude of the challenge that has been caused by delay given the limited carbon budget can be seen from a recent statement of Jim Hansen who said that “the required rate of emissions reduction would have been about 3.5% per year if reductions had started in 2005 and continued annually thereafter, while the required rate of reduction, if commenced in 2020, will be approximately 15% per year. Without doubt every delay in reducing ghg emissions makes the problem more difficult and more expensive to solve. For this reason, all nations should aim to reduce ghg emissions as quickly as possible and any nation which opposes doing so on the basis of scientific uncertainty should be asked if the nation is willing to take full legal and financial responsibility for harms caused by any delay. The above chart also helps explain the gross unfairness of requiring all nations to reduce by the same percentage reduction rates to achieve the globally needed emissions reductions because some nations are emitting at vastly higher per capita rates and some nations are responsible much more than others for raising atmospheric ghg concentrations to current dangerous elevated levels which are now in excess of 400 ppm CO2. 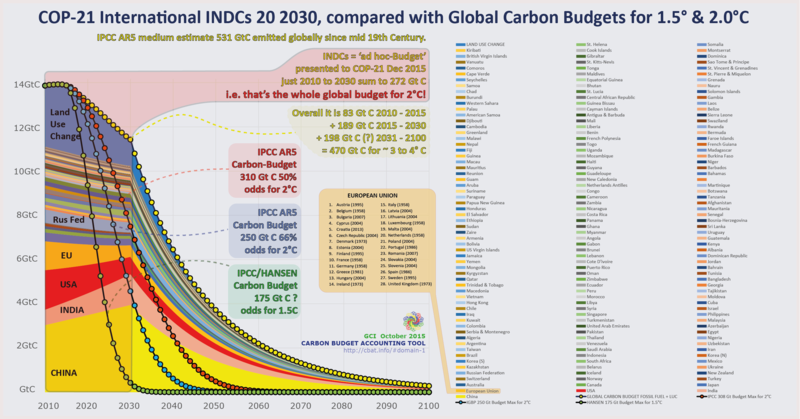 .If each nation had to reduce their ghg emissions only to conform to the rates described in the reduction curves in the above chart despite their steepness, it would lead to grossly unfair results because of great differences among countries in per capita and historical emissions levels and urgent needs to increase energy consumption to escape grinding poverty in poor developing countries. 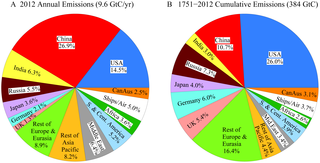 The above chart gives some indication of huge differences in nations in per capita ghg emissions. If nations must reduce their ghg emissions by the same percentage amount, then such an allocation will freeze into place huge differences in per capita rights to emit ghg emissions into the atmosphere. If, for instance, the United States and India are required to reduce ghg emissions by the same percentage amount, for instance 90%, then the US per capita emissions of approximately 20 tons CO2 per capita would allow US citizens to emit CO2 at the rate of 2 tons per capita while the current India per capita emissions of approximately 1.8 tons per capita would mean that the Indian citizens could emit only at the rate 0.18 tons per capita even though India needs to dramatically increase its energy use to assure that hundreds of millions of people economically rise out of grinding poverty and India has comparatively done little to cause the existing problem. 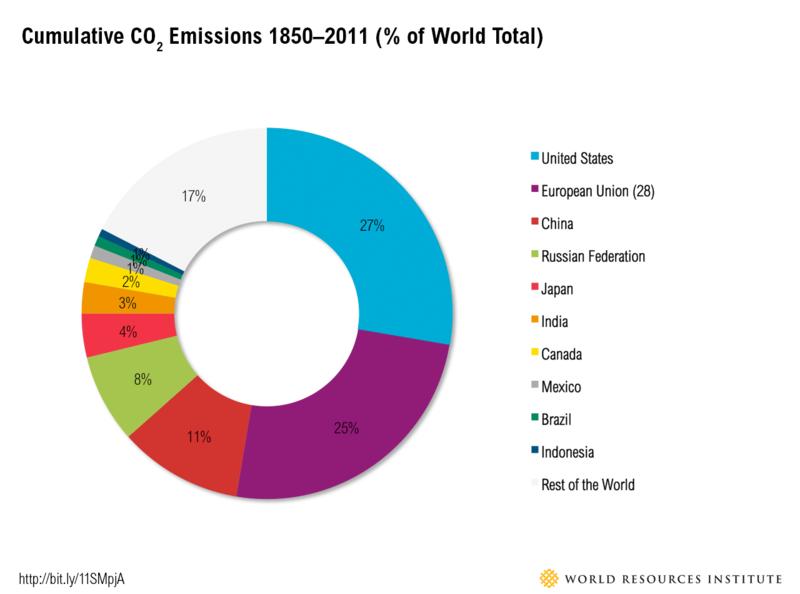 This result is clearly grossly unfair particularly in light of the fact that India has emitted far less tons of CO2 than most developed countries and therefore is less responsible for causing the existing problem than many developed nations. If some consideration for historical responsibility is not taken into account in allocating national responsibility for ghg emissions reductions, then those poor nations which have done very little to create the current threat of climate change will be required to shoulder a greater burden of needed global ghg emissions obligations than would be required of them if responsibility for the existing problem is not taken into account. As a result, although there are reasonable differences of opinion among nations about how to consider historical national ghg emission in determining national ghg emissions reductions allocations, including when, for instance, historical responsibility should be measured, almost all equity frameworks agree that prior levels of ghg emissions must have some consideration in national ghg allocations.There is also reasonable disagreement in the equity literature about what weight should be given to other matters that are widely considered to be valid considerations in determining fairness including the economic capability of rich countries to pay for ghg emissions reductions technologies and per capita considerations. Yet unless fairness is taken into account in allocating national ghg targets necessary to prevent dangerous climate change, those nations who are mostly responsible for current elevated atmospheric ghg concentrations will not be held responsible for their past ghg emissions while nations who have done almost nothing to cause the rise of atmospheric concentrations will be held equally responsible for lowering emissions. From the above illustration it can be seen that the United States and the EU are more responsible for raising atmospheric concentrations to current dangerous levels than than the rest of the world combined. 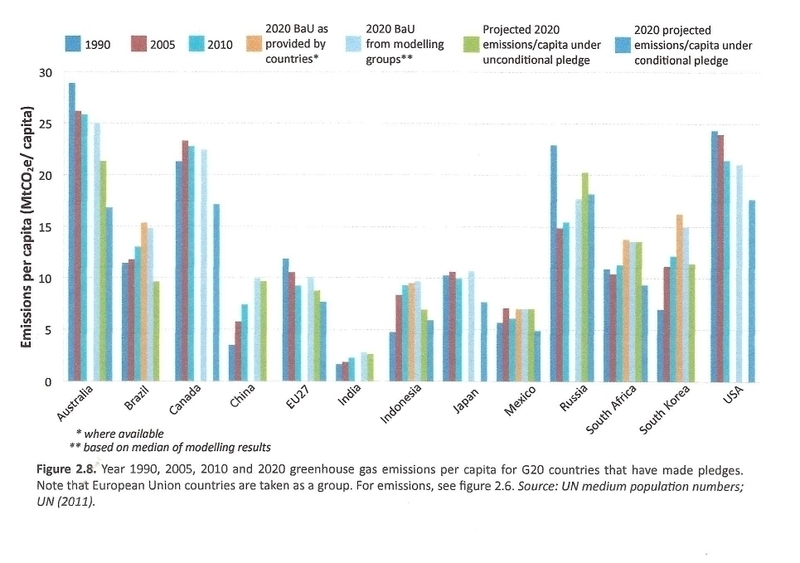 Although there is a difference of opinion in the “equity” literature about how to consider valid equity considerations including per capita, historical emissions levels, and the economic capabilities of nations to fiance non-fossil energies, all nations agree that national commitments about ghg emissions reductions must consider fairness. And so as a matter of international law under the Paris Agreement, national commitments to reduce ghg emissions must be based on achieving a warming limit as close as possible to 1.5 degrees C but no greater than 2 degrees C, a requirement often referred to as the level of “ambition” but national commitments also must be based on “equity” or “fairness.” Although there are some reasonable disagreements among many engaged in climate policy debates about what “equity” or “fairness” requires, all nations have agreed that their obligations to reduce ghg emissions must consider equity or fairness principles. However, if high-emitting nations take the “equity” and “fairness” requirement seriously, they will need to not only reduce ghg emissions at very, very rapid rates, a conclusion that follows from the steepness of the remaining budget curves alone, but also they will have to reduce their ghg emissions much faster than poor developing nations and faster than the global reductions curves entailed only by the need to stay within a carbon budget. 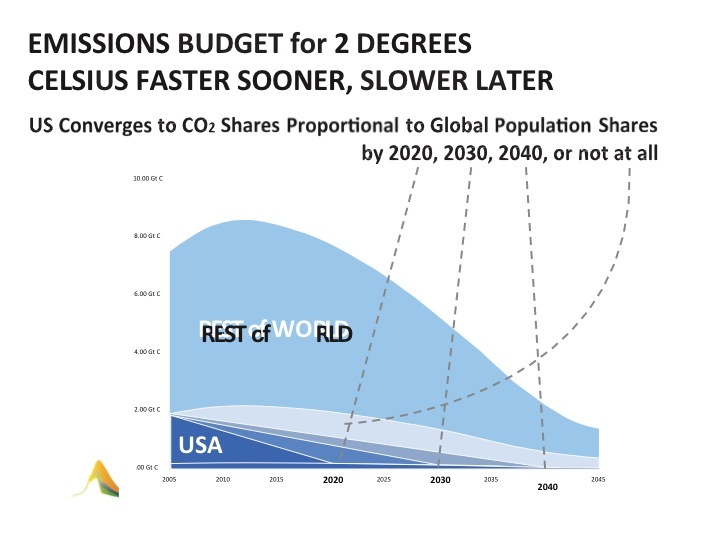 The above illustration prepared by the Global Commons Institute shows that even if only one equity consideration is taken into account, in this case per capita fairness, the USA ghg emissions reductions must be much faster than the rest of the world. Other organizations who have made calculations of the US fair share of the remaining carbon budget using different equity factors have concluded that the US fair share of safe global emissions is even smaller than that depicted in the above chart. 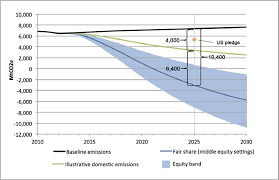 For instance the following illustration prepared by EcoEquity and the Stockholm Environment Institute shows that the US fair share of global emissions, making what the authors of the report claim are moderate assumptions of what equity requires, demonstrates that equity not only requires the US to reduce its emissions to zero quickly almost immediately but that US obligations to prevent a 2 degree C rise requires the US to substantially fund ghg emissions reductions in other countries by 2025 despite achieving zero emissions by 2020. The above illustration, following the assumptions about what equity requires made by the authors of the report about how to determine US emissions reductions obligations, leads to the conclusion not only does the United States need to achieve zero carbon emissions by 2020, the US must reduce its emissions by -141% from 1990 levels by 2025. National Fair Shares. p 18. This is to be achieved, according to the report, by US financial support for reductions in developing countries . Although national ghg emissions reductions commitments that have been evaluated by different organizations which have made different assumptions about how to calculate what equity requires of nations have come to different conclusions, most evaluations of national commitments made through an equity prism done before Paris concluded that even if they high emitting nations achieve net zero emissions by 2050, they will need, as a matter of equity and justice, to help pay the costs of emissions reductions in poor developing countries or finance technologies that will remove carbon from the atmosphere. The reasons for this are that the remaining carbon budget is so small, the per capita and historical emissions of high-emitting developed nations are so large compared to poor developing countries, and the financial resources of developed countries are so large compared to poor developing countries that equity considerations demand that the high-emitting nations financially help developing nations achieve their targets. Without doubt, if nations reduce their ghg emissions to levels required of them by ambition, that is levels required by conformance with a carbon budget necessary to assure that future warming is limited to 2 degrees C or 1.5 degrees C adjusted to also consider equity and fairness, the international community is faced with an extraordinarily daunting challenge. Moreover, any delay in meeting this challenge will make the problem worse. The Paris Agreement created a framework for solving the climate problem, yet the post-Paris media has poorly covered the implications for nations of what sufficient ambition and fairness should be required of nations when they formulate national climate policies if very dangerous climate change is to be avoided. As a result, there appears to be little awareness of the huge damage that will likely be caused by further delay. The research report of Widener University Commonwealth Law School and the University of Auckland has revealed that there appears to be little awareness around the world about what ambition and equity requires of nations when they formulate national climate change policies. As a result the international community is not likely to respond with sufficient urgency and ambition unless greater awareness of the policy implications of the need to live within a carbon budget at levels required of nations because of equity and fairness considerations. Because of this, perhaps the most important immediate goal of climate change policy proponents is to help educate civil society and governments about the need to move urgently to make extremely rapid decreases in ghg emissions whereever governments can and to the maximum extent possible in light of the policy implications of limiting national ghg emissions to levels constrained by a carbon budget and in response to what fairness requires of nations. . The enormity and urgency of global ghg emissions reductions that are needed to limit warming to 1.5 or 2 degrees C. Only when citizens fully understand the limited carbon budget that remains to be distributed among all the nations of the world if the international community is going to retain hope of limiting warming to non-dangerous levels can they understand why all nations must increase their ambition in reducing ghg emissions to their fair share of safe global emissions. The evidence that 1.5 degrees C should be the warming limit for the world that all nations should seek to achieve rather than 2 degrees C. To the extent that the press has covered the controversy between setting a global warming limit at 2 degrees C or 1.5 degrees C. the press has left the impression as if this is simply a choice for the international community without explaining the enormous danger for many poor developing countries that turns on this choice. Unless citizens understand how some countries are put at much greater risk if the warming limit remains at 2 degrees C they cannot clearly reflect on their moral responsibility to act to limit warming to lower amounts. The implications of taking equity and justice seriously in allocating national ghg emissions reduction targets for the United States including the fact that if the United States would take its equitable obligations seriously it would not only have to reduce its carbon emissions to zero by 2050, it would have to financially contribute to the costs of emissions reductions in developing countries. The damage to the world from an almost 30 year US delay in taking serious steps to reduce the threat of climate change including the enormity of global ghg emissions reductions that are now necessary compared to the reductions that would have been necessary if the United States and the world acted more forcefully a decade ago or so earlier. The ethical and legal reasonableness of requiring high-emitting nations including the United States to financially contribute to the costs of adaptation, losses, and damages in poor, vulnerable nations that have done little to cause the threat of climate change. The enormity of growing costs for needed adaptation, loses, and damages in poor developing countries. Without a clear understanding of how adaptation and loses and damages costs increase dramatically as delays continue in making adequate dramatic ghg emissions reductions, citizens cannot evaluate the need of their nations to act rapidly to reduce ghg emissions. The failure of developed countries to meet their obligations to help poor vulnerable nations meet clear adaptation needs. Why the commitment on reducing ghg emissions by the Obama administration, despite it being a welcome change from prior US responses to climate change, is still woefully inadequate. The utter ethical and moral bankruptcy of the positions of opponents of climate change policies in the United States that are being presented in opposition to the Paris negotiations. This blog will cover these issues in more detail in coming entries. 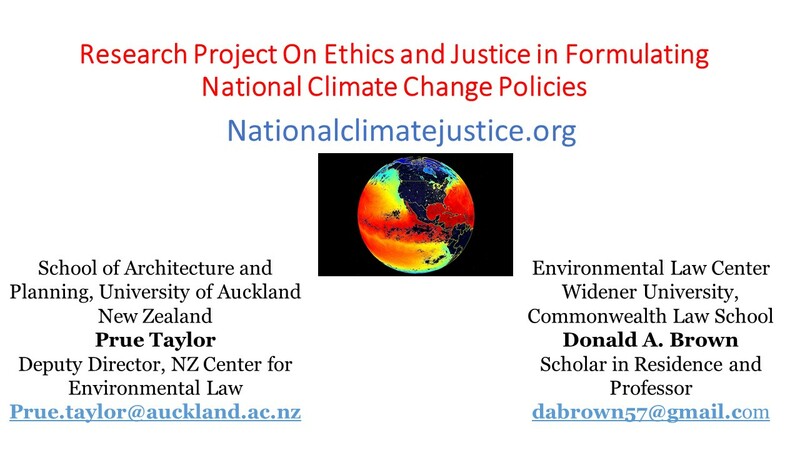 A joint research project of the University of Auckland and Widener University Commonwealth Law School has concluded that when most nations have formulated national climate change policies not only the nations, but also the NGOs and media in these nations, have failed to seriously consider equity, ethical, and justice considerations that should guide national climate change policy. The project enlisted the support of 23 researchers from around the world to examine how 23 nations actually considered or ignored equity, ethics, and justice in formulating national climate change commitments. Each researcher answered the same 10 questions which sought to determine how equity, ethics, and justice considerations affected national policy formation on greenhouse gas emissions reductions targets and commitments and on funding adaptation, l,osses and damages in vulnerable developing countries. The nations studied in this project are: Argentina, Australia, Bolivia, Brazil, Canada, China, Fiji , India, Italy, Japan, Kenya, Mauritius, Netherlands, New Zealand, Peru, Russia, Samoa, South Africa, South Korea, Thailand, Uganda, United States of America, and Zimbabwe. The reports on these countries are available on the project website, nationalclimatejustice.org. The research project has been motivated by the fact that climate change is a threat that screams for attention to be understood essentially as a problem of ethics and justice, an understanding which has profound significance for national climate change policy development but a fact which our research has concluded is largely being ignored by most nations. The research project seeks to help deepen reflection by nations and civil society on national responses to climate change by examining national climate change policies through an equity, ethical and justice lens. If nations fail to base their climate change policies on what equity, ethics, and justice require of them on mitigation of their greenhouse gas emissions and funding for adaptation, losses, and damages, then the global response to climate change will not likely be ambitious enough to avoid catastrophic climate impacts while deepening existing injustices in the world. (a) Almost all nations have actually based their INDC at least in part on economic self-interest rather than global ethical responsibility. (b) Not only have most nations ignored equity, ethics, and justice in domestic development of INDCs, national media and NGOs in most countries have not criticized inadequate INDCs on the basis of equity, ethics and justice. (c) Even nations that have given lip service to the need to develop INDCs that represent the nation’s fair share of safe global emissions, these nations have not explained how ethics and justice quantitatively influenced the formulation of the INDC and in most cases the INDC has actually been based on national economic self-interest. (d) National explanations of their INDC often hide the actual basis for the weakness of the INDC and to determine the actual basis for the INDC one must understand the domestic forces which opposed more ambitious INDCs. (e) In most countries there appears to be little understanding among civil society about what equity, ethics, and justice would require of the country in formulating its INDC particularly in regard to the practical implications of living within a carbon budget that would constrain global emissions so that atmospheric ghg concentrations remain below dangerous levels, and the need for the nation to limit its ghg emissions to its fair share of a carbon budget. The following lessons have been learned by the project so far. 1. Some high-emitting nations have expressly stated that they will not adopt climate change policies that harm their economy – thus ignoring their obligations to others as a matter of ethics, justice, and international law. These nations include Australia, Canada, and New Zealand. 2. Any national ghg emissions reduction commitment is implicitly a position on two ethical questions, namely, first, what safe atmospheric ghg concentration level the commitment aims to achieve and, second, what equity framework or principles of distributive justice the percent reduction is based on. Despite this, no nation has explained quantitatively how its commitment is related to an atmospheric carbon budget or an equity framework. 3. Although some nations acknowledge that their climate policies should be guided by ethical principles, for instance, South Africa and Japan, even these nations have not expressly explained quantitatively how their commitments were guided by ethical principles and appear to have based their commitments on economic self-interest at least in part. 4. A few nations have acknowledged that their ghg emissions commitments need to limit warming to 2°C and be derived from a fair and equitable framework, yet even these nations have not explained how their specific emissions reduction commitments can be understood to be consistent with an emissions reduction pathway that will limit warming to 2°C. In fact, despite the almost universal acceptance by nations of the 2°C warming limit, the actual ghg emission targets and timetables chosen by almost all nations do not meet the levels of emissions reductions specified by IPCC as necessary to keep atmospheric concentrations below 450 ppm and thereby achieve the 2°C warming limit. As a result the world is currently on target to hit warming of 3.7°C by 2100. 5. Those developed nations that have acknowledged that they should act to limit warming to 2°C have not adopted emissions reduction targets at levels the IPCC recently concluded would be necessary to limit warming to 2°C – namely, of 25% to 40% by 2020. 6. All nations, including those nations that acknowledge that their policies must be based upon a fair share of a safe global emissions, appear to have actually based their emissions reduction commitment at least in part on national economic self-interest rather than global responsibility. 7. In some nations it is not possible to determine the actual normative basis for the +government’s commitment simply by examining what the national government claims is its normative justification. Instead, one must understand the arguments made against stronger national climate change policies made by those who have successfully opposed stronger climate action. For instance, the United States commitment is based upon what is currently achievable under existing law. In Russia references to international obligations are mere lip service as the national INDC has been based almost exclusively on national economic interest. In the United States, because stronger laws have been successfully blocked by opponents of strong climate change policies on the basis that stronger laws will harm the US economy, destroy specific industries, and destroy jobs, the actual US climate change policies are based upon US economic interests, a fact not clear from examining the statements of the US federal government alone. 8. Some non-Annex 1 countries including China and Mauritius claim that their non-Annex 1 status is justification for making no binding commitments to reduce their ghg emissions even though a substantial percentage of their population has very high income and high per capita emissions. For instance, China per capita emissions are 7.1 tons while the US is 16.4 tons per capita. However, 10% of Chinese have ghg per capita are well above 10 % of US citizens ghg per capita. China has more than 1.1 million millionaires and more people with wealth over 50 million than any country except USA. By 2018 China is expected to have 2.1 million millionaires. There is a huge consuming class in China on which the government is creating no expectations. One of the ethical issues raised by these facts is whether nations which may have much smaller national emissions reductions commitment obligations for the nation derived from an acceptable equity framework should nevertheless be expected to limit activities of individuals causing high levels of ghg emissions. 9. Some nations, including Australia and New Zealand, have expressly made their commitments to reduce climate change policies contingent on the willingness of other nations to make commensurate commitments thus implicitly claiming they have no obligation to reduce their emissions to their fair share of safe global emissions unless other nations do so. The justification for this approach is not stated in the national commitments and is ethically dubious. 10. NGOs who support stronger climate change policies in many nations, including those in Australia, Canada, and the United States, are failing to frame climate change issues on the basis of ethics, justice, and equity. 11. Several developing nations, including Bolivia, have asserted that they have no obligation to make commitments to reduce ghg emissions unless the costs of reductions are funded by developed nations without identifying an equity framework which justifies this conclusion. South Africa and other developing nations have made commitments while also claiming that some of their commitments are contingent on funding from developed nations without explaining why some of the commitments should be funded according to an equity framework to justify which part of their climate change policies must be funded by developed nations. For this reason developing nations need to take a position on an equity framework that would apply to all developing countries. 12. Bolivia claims that funding for mitigation and adaptation in developing nations should be understood as the climate “debt” of developed countries in response to their historical, high-level per capita, and failure to fund adaptation but has not offered an equity framework to operationalize this claim. Bolivia draws strongly and explicitly upon ethical justifications for requiring deep cuts in national ghg emissions by other nations, together with financial contributions and holistic mitigation and adaptation measures, capable of both reducing poverty and vulnerability to climate change – yet has not identified an equity framework that could be applied at the global scale. 13. Several countries, including Bolivia, Fiji, South Africa, Kenya, and Uganda, have asserted that domestic justice issues need to be considered to reduce domestic poverty in setting national climate policies although they have not offered an equity framework to operationalize this idea at the global scale. Their positions appear to argue that domestic justice obligations can trump global responsibilities. 14. Several developing countries have primarily considered ethics and justice issues in regard to how climate policies affect domestic justice considerations rather than global justice issues. 15. Bolivia has claimed that 6% of GDP of developed nations should be devoted to funding climate change needs in developing nations but has not explained the equity framework that supports this conclusion. 16. Most developing countries, including Bolivia, strongly support a “loss and damages” mechanism while some developed nations oppose this mechanism. The United States denies any responsibility for losses and damages in other countries. 17. Several countries, including Canada have made commitments to reduce ghg emissions but not adopted the regulatory programs needed to achieve their commitments. 18. Several governments including Canada, have domestic legal obligations to protect vulnerable minorities from climate change which they are not fulfilling. activities that cause ghg emissions in the nation only regional and local governments have legal authority to require lower emissions. For instance in the United States, local and state governments regulate aspects of transportation and land use not regulated by the federal government. Some national governments including Australia that have made weak INDCs for the nation, nevertheless contain local governments that have made aggressive ghg emissions reductions commitments. 20. Most nations have not created programs to encourage individuals to greatly reduce their carbon footprint. 21. Some developing countries have set meaningful ghg emissions targets including Mauritius and South Africa but depend on funding from developed nations to achieve some of the climate goals. South Africa, despite being a non-Annex 1 developing country, has acknowledged its status as the highest ghg emitter on the African continent and announced a voluntary emissions reduction target, the objective of which is to make a ‘fair contribution’ to keep global concentrations within the range required to keep within the 2°C warming limit. South Africa openly acknowledges the need to voluntarily respond to climate change despite being a poor developing country. Yet the actual emissions reduction target identified by South Africa does not explain how it is quantitatively linked to an atmospheric concentration goal that will achieve a warming limit or why its emissions reduction target represents South Africa’s fair share of safe global emissions. In fact, the South African target, because it is a commitment only to reduce emissions below business as usual expansion, allows for large increases in South African ghg emissions by 2020 and 2025 without explaining how these increases are consistent with a specific understanding of what equity requires. 22. No developed country has explained how their contributions to the major climate funds relate in any quantitative way to their obligations under the UNFCCC for adaptation, mitigation, or losses and damages. 23. Almost all nations need to increase awareness among citizens and the press of the policy significance of the ethical and justice dimensions of climate change. 24. In some high-emitting developed nations, including the United States, the media is utterly failing to cover the ethics and justice dimensions of national climate change commitments. 25. In the case of EU member states, the collective decision making process of the EU does not seem to have led to any greater ethical analysis at the national level for individual EU nations, including the Netherlands and Italy, when these nations set their emissions reduction targets. 26. A few developing nations , including South Africa and Uganda, recognize the need to take positive action on climate change because they recognize the need and the responsibility toward their own nationals. 27. Two national reports revealed some reference to the concept of contraction and convergence, but no nation is implementing this approach. 28. No developed nations deny responsibility for funding adaptation and loses and damages in poor vulnerable nations, but no nation has made an express link between their ethical responsibility for supporting adaption and compensation for losses and damages and what funds have been committed`. Adaptation contributions seem to be left to the largess or interests of individual nations, leaving them free to withdraw. Including Australia, or determine the scale and nature of contributions. Even when a nation is a major contributor to adaptation (e.g., Japan), its activity is not explicitly linked to its own emissions targets. 29. There was a noticeable absence of explicit use of the concept of climate justice by developed nations. In contrast, Bolivia is using the concept of climate debt to mean liability for historic and continuing emissions and failure to take mitigation and adaptation actions. As the Bolivian report details, Bolivia is the champion on climate justice with a highly developed and multi-faceted concept that includes demands for a compensation mechanism beyond provision for adaptation of developing states. 30. Some developing nations, for instance, Brazil have committed to increase resilience and adaptation responses. 31. 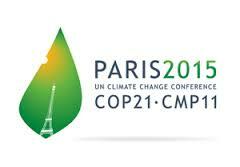 Some developing nations including Brazil have encouraged local and regional climate change plans and strategies. 32. Some developing countries including Bolivia, for instance, have made significant commitments to increase non-fossil energy. 33. Bolivia has advocated the ‘Climate Justice Index’ which calculates each country’s ‘fair share’ of atmospheric space according to their; 1) historical responsibility since 1750; 2) ecological footprint; 3) development capacity; and 4) technological capacity. According to this methodology, Bolivia asserts that non-Annex I (developing) countries should have 89% of the remaining atmospheric budget, leaving Annex I (developed) countries with just 11%. However, Bolivia does not go into details about how the 89% of atmospheric space reserved for non-Annex I countries should be divided, nor what types of commitments each country would be responsible for given their positioning on the index. 34. Some national level NGOs (including several in India) have expressly examined national INDCs on the basis of ethics and justice but most have not. 35. In some countries (e.g., Australia), even when media coverage of INDCs considers justice, this coverage misleads citizens by comparing commitments to other nations without any analyses of how equity and justice considerations would allow differences between national commitments. 36. Some countries (including Australia) argue for the need to take economic considerations into account by arguing about the future demand for coal without fully explaining why larger investments in non-fossil fuel sources are impossible. 37. Some nations’, including Australia’s, commitments to the Green Fund have been taken from existing foreign aid budgets – thus providing no new funds that would represent the nation’s satisfaction of it is obligations to fund adaptation and resilience in vulnerable developing countries. 1. All nations should be required to explain quantitatively how their emissions reductions commitments will achieve an acceptable warming limit and on what equity framework or principles of distributive justice their percent emissions reductions is based. For this reason, Intended Nationally Determined Contributions (INDCs) should identify: (1) tonnes of CO2eq emissions reduced rather than a percent reduction from a baseline year, (b) the temperature limit and associated carbon budget that the INDC is seeking to achieve, (c) the equity principles that the nation relied on to assure the justice of its INDC, and (d) For Annex 1 countries, ghg emissions in 1990, the common baseline year. 2. There is an urgent need in most nations to raise public awareness of the ethical and justice issues entailed by climate change policymaking in general and ghg emissions commitments in particular. Along this line there are several issues in particular about which greater awareness is needed including greater public understanding of the ethical implications of any nation’s ghg emissions reduction commitment in regard to an atmospheric stabilization goal the commitment is seeking to achieve and the coherence or lack there of the national commitment to an acceptable equity framework. 3. An international mechanism under the UNFCCC is urgently needed that helps other nations and civil society to understand the lack of conformity of national ghg emissions targets with principles of ethics and justice. This mechanism should provide that any government’s positions on their climate change commitments can be questioned by other governments and NGOs in regard to the adequacy of the commitment to achieve a warming limit and the fairness of the reductions. This mechanism must also require governments to respond to these questions. 5. NGOs should justify their policy analyses and action recommendations on ethical grounds. 6. Nations should be required to explain how their commitments to fund adaptation and losses and damages in poor vulnerable nations link to their ethical obligations to provide funding. A mechanism to fund losses and damages in vulnerable countries is necessary. 8. Developing nations should adopt programs that will create ghg emissions limitations for high-emitting individuals and organizations even if equity and justice considerations don’t require that nations significantly reduce national ghg emissions. 9. National media need to significantly increase their coverage of how ethics, justice, and equity considerations should affect national climate change policies. 10. Developing nations that make commitments based upon funding from developed nations should be required to explain the equity framework that led to the claim for the contribution.In this regard claims of ecological debt should include explanation of the equity framework on which the equitable debt claim is based. 11. Nations who claim that duties for domestic justice trump global responsibilities should explain quantitatively how they reached this conclusion. 12. Nations who make ghg emissions reduction commitments should identify (to the extent practical) the regulatory programs or policies that will achieve the reductions. 13. Nations should develop a program encouraging local and regional governments to adopt climate change emissions reductions programs. 14. All governments should adopt programs that encourage individuals to reduce their carbon footprints to fair levels. 15. Where national commitments have been deduced from collective decision making – such as the case in the EU – nations should be required to explain the equity and justice basis for its national commitment. 16. Nations should explain domestic programs they have adopted on adaptation and resilience. 17. Developing countries that claim certain amounts of atmospheric space should be allocated to developing countries should explain their reasoning. 19. Nations should be required to explain the fairness of their current and projected per capita emissions levels. 20. Nations who justify lower INDCs on the inevitability of the need for continuing fossil fuel use (including coal) should be required to explain what economic or technical consideration were assumed in implicit claims that greater uses of non-fossil fuel is impossible. 21. If a developed nation’s contribution to climate funds such as the Green fund are simply a shift of money from existing foreign aid funds, they should expressly admit to this while explaining why they have no ethical obligations to increase funding for adaptation and response in vulnerable nations.